Why could taps be an issue? In the UK we use around 140 litres of water per person per day. Much of this is used in the bathroom. On average a leaking tap can waste up to 5,500 litres of water a year. 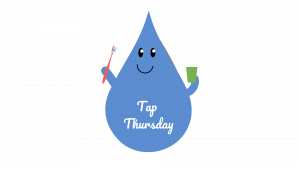 Turning the tap off when you brush your teeth can save 24 litres of water, per person, per day, which is approximately 8760 litres a year. If everyone in the UK turned off the tap when brushing teeth we could save 1,584,000,000 litres (1584 megalitres) a day! Taps can vary in flow volume, from 2 – 25 litres per minute. People’s behaviours also vary – whether you fully twist the tap or how long you leave it on for makes a difference. A garden hose or sprinkler can use as much water in an hour, as an average family of four use in a day. Try adding a washing up bowl or plug into your sink to catch excess water. This can reduce water wastage by 50% and be used to wash your veg in. Make sure to fully close the tap when you’re not using it. Don’t run the tap while brushing your teeth.